United States Naval Flight Officer, Jay Johnson, took to the internet for a brief time – a rare time afforded to him and his fellow officers on sporadic occasions – to address one of the pressing issues regarding the upcoming next generation of home console entertainment. Johnson is not supporting the Xbox One, as well as a few other United States service members of the armed forces, because they won't be able to play it. In a rather touching and earnest blog post on Gamasutra, Johnson lays out his love for gaming. How the off hours of his work as an aviator leaves him and a few of his fellow crew-mates to indulge in the pleasures of interactive entertainment...entertainment provided by the Xbox 360, and its iconic library of thrilling titles. Johnson wants to support Microsoft; he wants to stay loyal to the Xbox brand and the games that he loves, however it will become an impossibility with the Xbox One given the restrictive and mandatory service policies that would leave many U.S., service men and women bereft of playing games on the Xbox One due to the required online component that isn't available to them when they travel abroad. The feeling of vacancy, according to Johnson, would have to be fulfilled in the interim with a PlayStation 4. Why? Because you can play it offline without a mandatory 24 hour online check-in, something that service members don't always have regular access to. 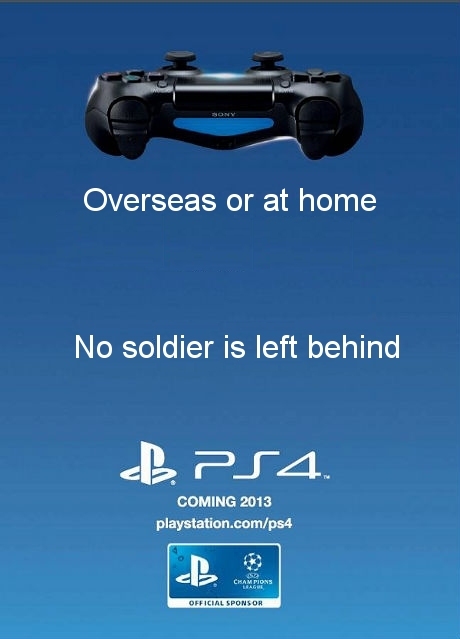 My brothers and sisters in arms, will not ever be able to play Xbox One when deployed or on detachment. No longer will the sounds of Master Chief saving the human race echo through the hallowed halls of the USS Abraham Lincoln, or any other USS Ship, when we have a few hours respite. No longer will you see Marcus and Dom sawing through the Locust Horde at the bases in Afghanistan after the Marines have returned from patrol and want to escape their reality for a bit. Those days are now firmly behind us. Microsoft has single handedly alienated the entire military, and not just the U.S. military, the militaries of the entire world. The tempest of emotions that enraptured Johnson to feel betrayed and abandoned by the company he and his fellow service members were so dedicated to is not an isolated case. “Xbox was the previous favorite," ... "'Halo' has always been an essential team LAN game aboard ship. It was almost a standard. Lots of people had it so easy to link Xboxes for 4 on 4,"
Despite my preference for the previous generations of Microsoft systems, and my dedication to their versions of multi-platform properties, I will not be buying an Xbox One at launch. I feel like I will be in much better hands with Sony. So, how much will I really be missing out on? While I think Forza is superior (so far) to Gran Turismo, the GT series is still very good, and I can play it when embarked on the ship. While I am a diehard Halo fan, the wait for the next iteration and my eventual purchase of my Halo-Box will give me ample opportunity to explore the Killzone series. Everything else, from Assassin’s Creed to Call of Duty, I can experience on the PS4, offline and tucked away in my little room on the ship, and without the concern of the programming complications that faced developers with the PS3. With region restrictions that extend to the very doorsteps of the developers making games for the Xbox One, the console has managed to pick up enemies where many would prefer to be allies. The question is, will Microsoft parley policies for the armed servicemen and women of the United States armed forces, or will they stay the course and forfeit their supporters to Sony's regime?